Picture is of a 6" x 6" wireway with two PVC air vents running through the middle. The top of the vent is required to be a specific height above the equipment below, so holes were drilled in the wireway and the pipe run through it. 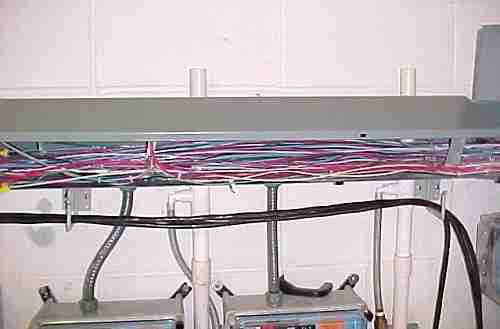 Raceways or cable trays containing electric conductors shall not contain any pipe, tube, or equal for steam, water, air, gas, drainage, or any service other than electrical. it always amazes me that other trades have the unabashed gumption to mess with ours. wonder what the other trades would do if you cut out the pvc pipes and plugged the wireway. how did this get by the AHJ? "DANGER! ELECTRICAL ZONE... NOTHING GOES HERE as per 1999 NEC 110-16(a). Failure to comply will result in extremely expensive change-order costs and procedures." like that idea are you sure the general can read? well Virgil,the idea has merit! they all backed off, and all i heard was mumbles and grumbles about that sparky's higher than normal voltage! If you run into the character that did this on a job, replace his icemaker line for the refrig with a piece of bare #4 sol Cu. The fittings fit just perfectly, and it won't leak, even into the icemaker. Looks like a Darwin candidate was here! I'd like to know how he managed to avoid nicking any wires when he drilled- and how he killed the power!